At Wilmington Fibre, we are proud to have provided high quality non-metal fabrications from our facility in New Castle, Delaware since 1904. This tradition is exemplified by our state-of-the-art stamping and die cutting of non-metal materials. 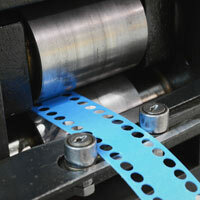 This service utilizes several methods, including punch press; open back incline (OBI), creasing, and scoring. Our machinery has a press rating of 10 to 35 tons and a press speed of up to 22,000 parts per hour, producing parts with thicknesses of .005" to .25", and tolerances of ±0.005". 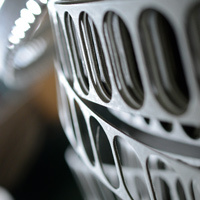 We stamp and die cut a wide variety of non-metallic materials, including Delrin®, Nylon, Lexan, PVC cork/rubber, Garlock®, PTFE, PEEK, Mylar®, and Vulcanized Fibre just to name a few. We also offer hot stamping, pad printing, packaging, and parts approval services to augment our non-metal stamping and die-cutting. We work with parts in numbers anywhere from 1 to 10,000,000, with typical lead times of 2 to 4 weeks depending on the quantity ordered. We are a one-stop shop with vast capabilities that ensure that all work is done in-house, and to industrial standards such as ASTM-D-710, MIL-I-24768, FDA, and AMS. We have over 4,000 existing flat washer dies available with OD sizes ranging from 1/8” up to 6” in diameter. With this kind of tooling catalog to pull from, there is a pretty good chance that we just might have existing tooling to produce the washer you are looking for without a tooling charge. If we don't have the correct size, it may be possible to alter an existing tool at a minimum charge. Besides simple OD/ID flat washers tooling, we have over 300 shoulder washer dies available for punching vulcanized fibre swaged washers. As well as a variety of tools for discs, rectangles, key tags, and end laminations. If your part is more complex than a flat washer and hard tooling is required, our tool and die shop is available to make necessary tooling at a very competitive price. Equipped with state-of-the-art EDM machines and CNC turning and milling centers, our experienced tool and die makers can produce some rather complex tooling. To learn more about the advanced non-metallic stamping and die cutting services that we offer at Wilmington Fibre, please see the table below or contact us directly.